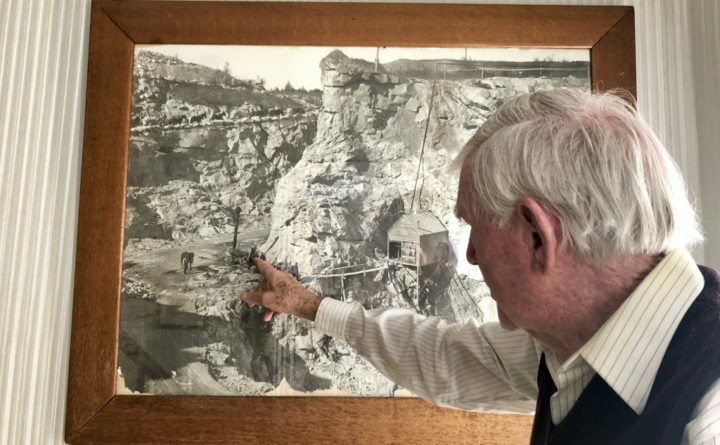 David Hoch, the last president of the Rockland-Rockport Lime Company, has a treasure trove of relics from the limestone industry in his home, including this photo of one of Rockland's many limestone quarries. ROCKLAND, Maine ― David Hoch had only worked for the Rockland-Rockport Lime Company for about four years when he was given the heavy task of telling the crews that the company’s four remaining lime kilns were going to be shut down indefinitely. Until then, for more than a century, lime kilns lined Rockland’s harbor, burning limestone mined from a maze of quarries located on the other side of the city. The limestone was shipped down the Eastern Seaboard, where it would be used for mortar and plaster, helping build cities like New York and Boston. 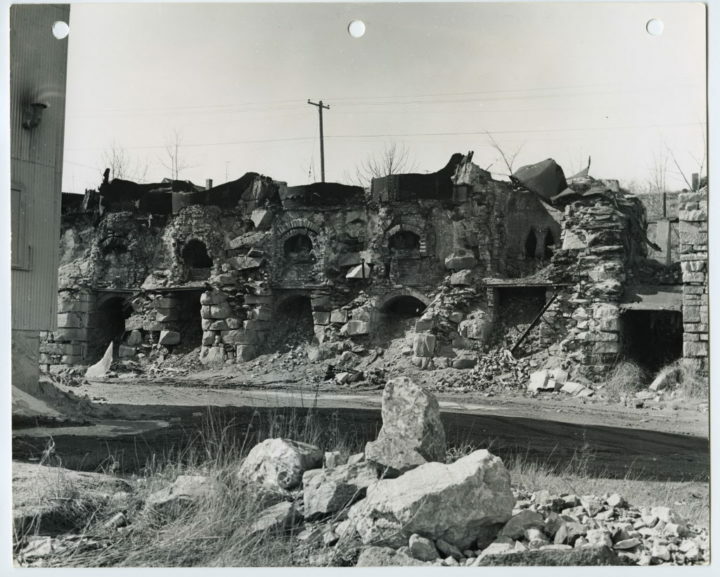 But in 1958, the last of Rockland’s kilns went dark. Sixty years later, it’s a fact that Hoch, at 89 years old, just can’t shake. Hoch would be the last president of the Rockland-Rockport Lime Company, which shuttered a couple decades after the kilns went out. Today, he’s one of the last people in Rockland with a direct link to the industry. A limestone quarry in Rockland around 1870. The city’s relationship with limestone started before Rockland was even its own municipality, and can be credited to a vein of limestone that stretches from Thomaston through the Rockport-Camden area. Limestone is a sedimentary rock formed underwater over thousands of years, Hoch said. It is formed from skeletal fragments of marine organisms. It is commonly used for building materials such as mortar, plaster, concrete and cement. Quarrying of the limestone deposit in the Rockland-Thomaston area predates the Revolutionary War, according to Merriam, though on a very small scale. By the 1800s, dozens of quarries were forming to harvest the limestone. The Williams Quarry in Rockland was over 400 feet deep. Much of the quarrying and lime burning was happening in a part of what was then Thomaston, called Shore Village. Around 1850, when the village separated to form its own town, community members named it Rockland, a nod to the lime industry that was causing the village to rapidly grow, according to the book, “Images of America: Rockland Area Lime Industries,” written by Hoch, Merriam and Courtney C. MacLachlan. The city was incorporated in 1854, and by 1870, its lime industry had taken off. 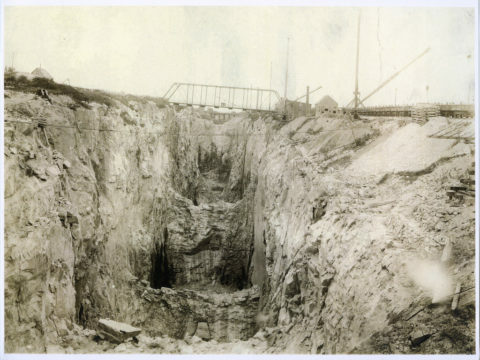 Aside from the high quality of the lime deposit, the proximity of the quarries to Rockland Harbor propelled the city’s success in the industry. “It was so easy to transport [limestone] from here because we had the access to the ocean,” Rockland Historical Society curator Ann Morris said. If it hadn’t been for limestone being shipped from Rockland, Merriam and Hoch said the growth of east coast cities like New York and Boston would have slowed without easy access to the building materials. An undated photo of the Lime Rock Railroad which encompassed Rockland during the peak of the limestone industry. In response to the lime industry’s presence in Rockland, Merriam said secondary industries flourished, especially shipbuilding. 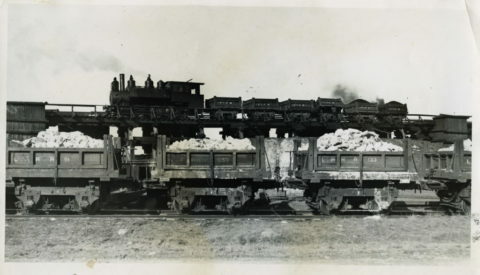 An entire railroad system, called the Lime Rock Railroad, was built around the city, Hoch said, transporting the heavy limestone that was dug out by hand on the backside of the city to the kilns on the harborside. Rockland also has the claim of going the deepest in the country to mine for limestone, Hoch said, with the Williams Quarry being dug more than 400 feet deep. It was a marvel that President William Howard Taft needed to see for himself when he was in Rockland in the early 1900s, Hoch added. The city’s success gave it the nickname, “The Lime City,” Hoch said. “It’s really the biggest and the longest lasting industry [to happen in Rockland],” Merriam said. Some of the last remaining lime kilns in Rockland after they were torn down. By the time Hoch’s chapter in the limestone industry came to be in the mid-1950s, the industry had drastically declined. In 1900, the Rockland-Rockport Lime Company bought up all of the smaller lime companies in the city, Morris said. But as new building techniques were being introduced, Morris said the demand for lime began to decrease. By the mid-1900s, Hoch said the source of high quality limestone in Rockland had been largely depleted. The writing was on the wall. But Hoch was ― and still is ― an optimist. “Limestone has been a part of my life from day one,” Hoch said. 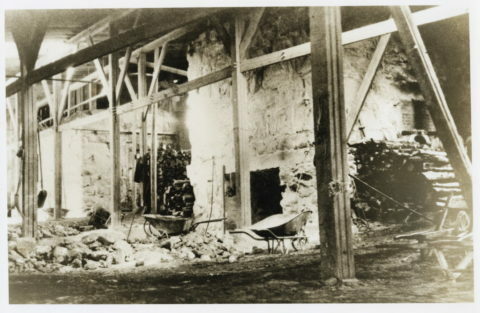 Lime kilns, where limestone was burned before it could be shipped, were housed in large "sheds," as pictured in this 1904 photo. His father came to Maine from Pennsylvania in the 1920s to work at the Dragon Cement plant in Thomaston, which still mines limestone to use in the cement and concrete it produces. But it was just by happenstance that Hoch wound up being the last president of the Rockland-Rockport Lime Company. In 1954, he was selling stock in Rockland after returning from the Army, where he served in the Korean War. One day on the job, he tried convincing the then president of the Rockland-Rockport Lime Company to buy shares of stock, but instead, Hoch ended up with a job offer. At first he resisted the offer to take on the position of foreman, which would make him third in command of the company. But his optimism got the best of him. 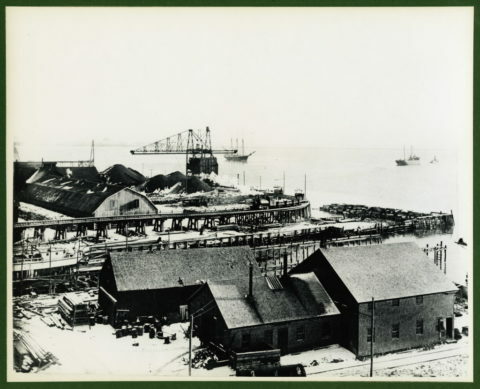 An undated photo of the Rockland-Rockport Lime Company's operations in the north end of Rockland. When the company decided to stop burning lime in 1958, the focus shifted to producing limestone for other purposes, such as agricultural lime. Hoch said the company was selling about 70,000 tons a year to Maine farmers who would use it on their fields. The process involved grinding the limestone into a fine dust, much to the ire of city officials. The company’s operations were based on the waterfront in the city’s north end, right next to the fish rendering plant, SeaPro, which produced rotten fish odors that also frustrated the city. Hoch eventually worked his was up the company ladder, and after the president died, Hoch was the only one there to take over. He tried several different avenues to keep the company going, including expanding their welding operations to take on outside work. That eventually formed R&R Engineering, which became as big as the lime end of the business. But his efforts, and optimism, weren’t enough to keep the company going. The past debts of the business eventually caused the bank that had financed much of the company to foreclose on it. Merriam said this happened around 1980. 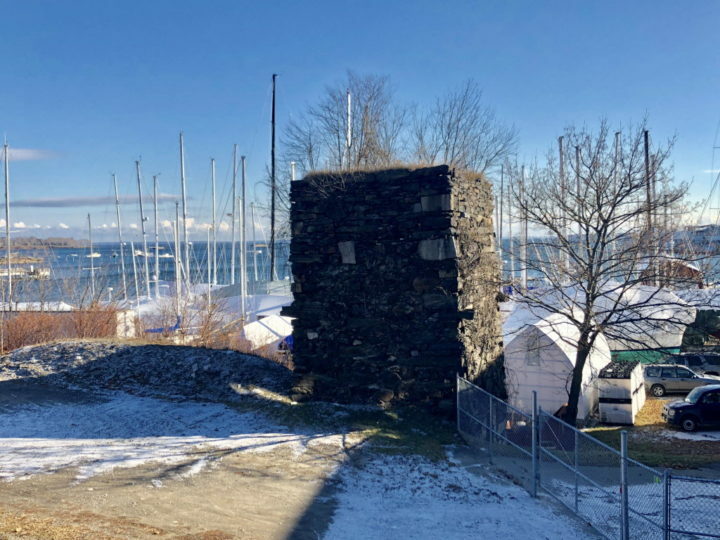 A 200-year-old lime kiln is the only kiln still standing in Rockland. At one time there were about 160 lime kilns in the city. The city’s ties to the limestone industry aren’t as obvious in present day, as say, the city’s deep maritime roots. But remnants of the past creep through. Along Old County Road, abandoned limestone quarries, now filled with water, peek through foliage ― creating allure and safety concerns. 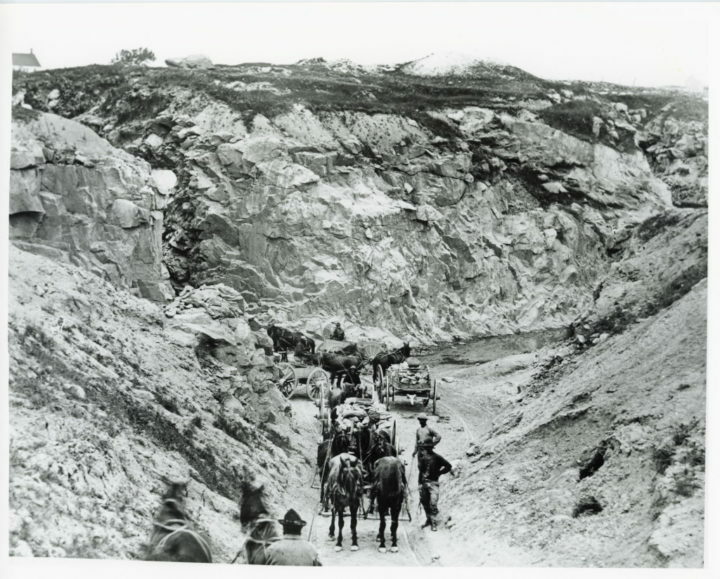 Since 1962, six people have died in accidents involving the abandoned quarries, according to Bangor Daily News archives. Just off Main Street, standing overgrown in a dirt lot, is a 200-year-old lime kiln, that Morris is hoping desperately can be preserved. The city owns several abandoned quarries, and has floated numerous plans to either fill or sell them. For decades, the city has been using one as a landfill for construction debris and other materials. The quarry landfill on Limerock Street closed to outside waste this past summer and the city is working on plans to cap the landfill. On Cedar Street, the last quarry in Rockland that was used for mining limestone has been turned into a man-made oasis. The repurposing of the former quarry into a private swimming hole left a positive impression on Hoch. And then of course, there’s no escaping the city’s name itself. Hoch doesn’t believe many people who live in Rockland today understand the immense impact that the limestone industry had on the city. He isn’t certain people will care. But given that Rockland wouldn’t be the city it is today without limestone, Morris hopes more people will consider the history of the industry as something worth remembering.